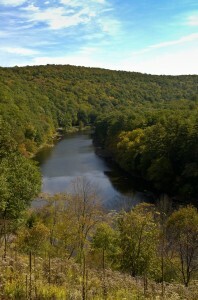 Cook Forest State Park & Clear Creek State Park are located about 2 hours northeast of Pittsburgh in Western Pennsylvania. 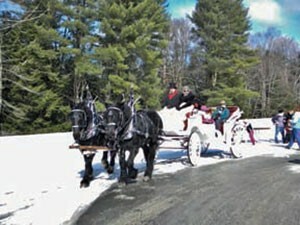 Regardless of the season, there is a reason to visit Cook Forest State Park & Clear Creek State Park. Whether it’s to enjoy the splendor of the mountain laurel and rhododendron, see the spectacular fall foliage, or to play in a virtual winter wonderland, Cook Forest State Park and Clear Creek State Park are waiting for you! • Explore an ancient forest. • Bike on a scenic bicycle trail. • Hike on miles of trails fit for novice to the experienced hiker. designated wild and scenic waterway. 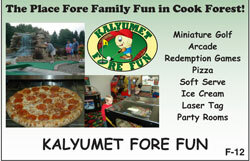 go-karts, bumper boats, miniature golf and more! • Geocaching, try your luck at finding one of our area caches. 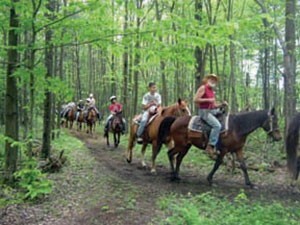 • Go horseback riding along forested trails. 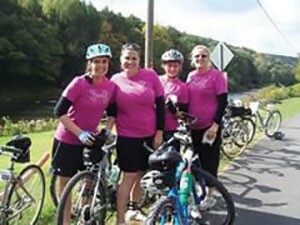 • Swim in the Clarion River. festivals. Visit a local flea market. 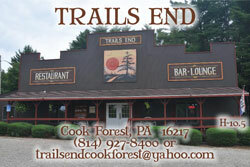 For your convenience, the Cook Forest Vacation Bureau has compiled this member website. For specific information or reservations, please contact the facility of your choice. Visit Cook Forest State Park and Clear Creek State Park with your family & friends. The Cook Forest Vacation Bureau is the official tourism & travel guide for Cook Forest State Park and Clear Creek State Park. Follow Cook Forest Vacation Bureau on Facebook, Twitter and social media for the latest news & events in the Cook Forest and Clear Creek area! Discover the latest Cook Forest Events, Cook Forest Activities and Cook Forest Things-To-Do by visiting the Cook Forest Events Calendar. 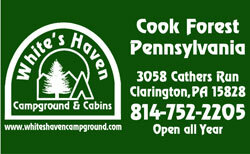 Search the Cook Forest Business Directory for Cook Forest Places-to-Stay, Cook Forest Places-to-Eat and Cook Forest Things-to-Do! Find Cook Forest Maps and Cook Forest Directions when traveling to Cook Forest State Park & Clear Creek State Park locations.